Elections results in Costa Rica declared Laura Chinchilla the country's first woman president, though presumably rather influenced by previous male ruler. Initial results from Sunday's vote gave her an almost unassailable lead and the main opposition contender, Otton Solis, has conceded. With 47% of votes, Mrs Chinchilla, 50, was 20 percentage points ahead and over the 40% threshold for an outright win. 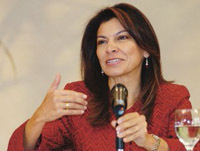 A former deputy to outgoing President Oscar Arias, she pledges to continue moderate free-market policies. Mr Solis - who was narrowly defeated by Mr Arias in Costa Rica's previous presidential vote - was quick to declare Mrs Chinchilla the winner. Critics of Mrs Chinchilla say she is too close to Mr Arias, and that he will continue to control government policies. The party of Mr Arias, a Nobel Peace Prize winner, has dominated politics for decades in what is one of Latin America's most stable countries. The Republic of Costa Rica is a country in Central America, bordered by Nicaragua to the north, Panama to the east and south, the Pacific Ocean to the west and south and the Caribbean Sea to the east. Costa Rica, which translates literally as "Rich Coast", constitutionally abolished its army permanently in 1949. Expenditure on the police corps is about US$17.99 per person. Costa Rica has consistently been among the top Latin American countries in terms of the Human Development Index, and ranked 54th in the world in 2007. The country is ranked 3rd in the world, and 1st among the Americas, in terms of the 2010 Environmental Performance Index. The country is very popular among tourists. The BBC News has contributed to the report.